This is a guest post from Trevor Sullivan, a Seattle-based Solutions Architect at Amazon Web Services (AWS). Since 2004, Trevor has worked intimately with Microsoft technologies, including PowerShell since its release in 2006. In this article, Trevor takes you through the process of using the AWS Tools for PowerShell to write and export metrics data from Amazon CloudWatch. Amazon’s CloudWatch service is an umbrella that covers a few major areas: logging, metrics, charting, dashboards, alarms, and events. I wanted to take a few minutes to cover the CloudWatch Metrics area, specifically as it relates to interacting with metrics from PowerShell. We’ll start off with a discussion and demonstration of how to write metric data into CloudWatch, then move on to how to find existing metrics in CloudWatch, and finally how to retrieve metric data points from a specific metric. Amazon CloudWatch stores metrics data for up to 15 months. However, you can export data from Amazon CloudWatch into a long-term retention tool of your choice, depending on your requirements for metric data retention, and required level of metric granularity. While historical, exported data may not be usable inside CloudWatch, after aging out, you can use other AWS data analytics tools, such as Amazon QuickSight and Amazon Athena to build reports against your historical data. For this article, we assume that you have an AWS account. We also assume you understand PowerShell at a fundamental level, have installed PowerShell and the AWS Tools for PowerShell on your platform of choice, and have already set up your AWS credentials file and necessary IAM policies granting access to CloudWatch. We’ll discuss and demonstrate how to call various CloudWatch APIs from PowerShell, so be sure you’re prepared for this topic. For more information, see the Getting Started guide for AWS Tools for PowerShell. Let’s start by talking about storing custom metrics in CloudWatch. In the AWS Tools for PowerShell, there’s a command named Write-CWMetricData. This PowerShell command ultimately calls the PutMetricData API to write metrics to Amazon CloudWatch. It’s fairly easy to call this command, as there are only a handful of parameters. However, you should understand how CloudWatch works before attempting to use the command. May have zero or more dimensions. May have a value, time stamp and unit of measure (eg. Bytes, BytesPerSecond, Count, etc.). May specify a custom storage resolution (eg., 1 second, 5 seconds—the default is 60 seconds). In the AWS Tools for PowerShell, you construct one or more MetricDatum .NET objects, before passing these into Write-CWMetricData. With that conceptual information out of the way, let’s look at the simplest way to create a custom metric. Writing metric data points into CloudWatch is how you create a metric. There isn’t a separate operation to create a metric and then write data points into it. If you have lots of metrics to track, and you’d prefer to avoid cluttering up your top-level metric namespaces, this is where metric dimensions can come in handy. For example, let’s say we want to track a “UserCount” metric for over 100 different Active Directory domains. We can store them all under a single namespace, but create a “DomainName” dimension, on each metric, whose value is the name of each Active Directory domain. The following screenshot shows an example of this in action. Here’s a PowerShell code example that shows how to write a metric to CloudWatch, with a dimension. Although the samples we’ve looked at in this article show how to write a single metric, you should strive to reduce the number of disparate AWS API calls that you make from your application code. Try to consolidate the gathering and writing of multiple metric data points in the same PutMetricData API call, as an array of MetricDatum objects. Your application will perform better, with fewer HTTP connections being created and destroyed, and you’ll still be able to gather as many metrics as you want. Now that we’ve written custom metrics to CloudWatch, let’s discuss how we search for metrics. Over time, you might find that you have thousands or tens of thousands of metrics in your AWS accounts, across various regions. As a result, it’s imperative that you know how to locate metrics relevant to your analysis project. You can, of course, use the AWS Management Console to view metric namespaces, and explore the metrics and metric dimensions contained within each namespace. Although this approach will help you gain initial familiarity with the platform, you’ll most likely want to use automation to help you find relevant data within the platform. Automation is especially important when you introduce metrics across multiple AWS Regions and multiple AWS accounts, as they can be harder to find via a graphical interface. In the AWS Tools for PowerShell, the Get-CWMetricList command maps to the AWS ListMetrics API. This returns a list of high-level information about the metrics stored in CloudWatch. If you have lots of metrics stored in your account, you might get back a very large list. Thankfully, PowerShell has some generic sorting and filtering commands that can help you find the metrics you’re seeking, with some useful filtering parameters on the Get-CWMetricList command itself. Let’s explore a few examples of how to use this command. Starting with the simplest example, we’ll retrieve a list of all the CloudWatch metrics from the current AWS account and region. If the results of this command are little overwhelming, that’s okay. We can filter down the returned metrics to a specific metric namespace, using the -Namespace parameter. What if you don’t know which metric namespaces exist? PowerShell provides a useful command that enables you to filter for unique values. If these results aren’t in alphabetical order, it might be hard to visually scan through them, so let’s sort them. Much better! Another option is to search for metrics based on a dimension key-value pair. It’s a bit more typing, but it’s a useful construct to search through thousands of metrics. You can even write a simple wrapper PowerShell function to make it easier to construct one of these DimensionFilter objects. If you know the name of a specific metric, you can query for a list of metrics that match that name. You might get back multiple results, if there are multiple metrics with the same name, but different dimensions exist in the same namespace. You can also have similarly named metrics across multiple namespaces, with or without dimensions. PowerShell’s built-in, generic Where-Object command is infinitely useful in finding metrics or namespaces, if you don’t know their exact, full name. This example shows how to filter for any metric names that contain “User”. Filtering metrics by namespace is just as easy. Let’s search for metrics that are stored inside any metric namespace that ends with “EBS”. That’s likely enough examples of how to find metrics in CloudWatch, using PowerShell! Let’s move on and talk about pulling actual metric data points from CloudWatch, using PowerShell. Metric data is stored in CloudWatch for a finite period of time. Before metrics age out of CloudWatch, metric data points (metric “statistics”) move through a tiered system where they are aggregated and stored as less granular metric data points. For example, metrics gathered on a per-minute period are aggregated and stored as five-minute metrics, when they reach an age of fifteen (15) days. 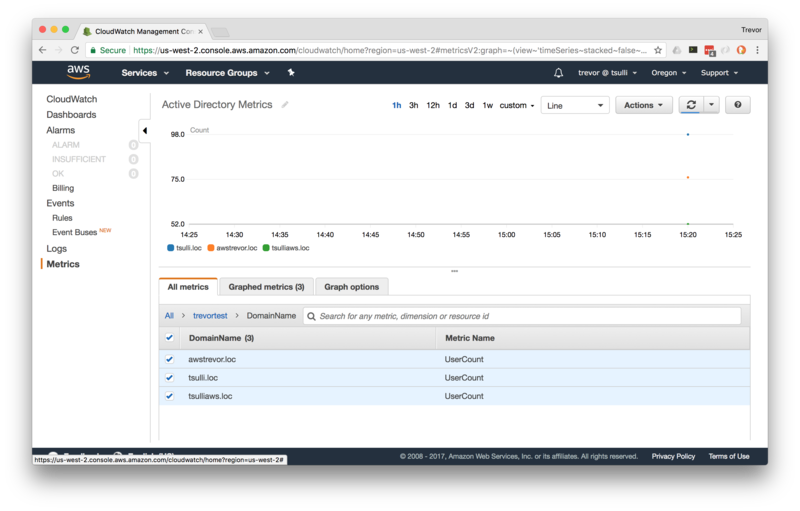 You can find detailed information about the aggregation process and retention period in the Amazon CloudWatch metrics documentation. Data aggregation in CloudWatch, as of this writing, starts when metric data points reach an age of three (3) hours. You need to ensure that you’re exporting your metric data before your data is aged, if you want to keep the most detailed resolution of your metric data points. Services such as AWS Lambda or even PowerShell applications deployed onto Amazon EC2 Container Service (ECS) can help you achieve this export process in a scalable fashion. The longest period that metrics are stored in CloudWatch is 15 months. If you want to store metrics data beyond a 15-month period, you must query the metrics data, before CloudWatch performs aggregation on your metrics, and store it in an alternate repository, such as Amazon DynamoDB, Amazon S3, or Amazon RDS. Now that we’ve covered some of the conceptual topics around retrieving and archiving CloudWatch metrics, let’s look at the actual PowerShell command to retrieve data points. The AWS Tools for PowerShell include a command named Get-CWMetricStatistic, which maps to the GetMetricStatistics API in AWS. You can use this command to retrieve granular data points from your CloudWatch metrics. There are quite a few parameters that you need to specify on this command, because you are querying a potentially massive dataset. You need to be very specific about the metric namespace, name, start time, end time, period, and statistic that you want to retrieve. Let’s find the metric data points for the Active Directory UserCount metric, for the past 60 minutes, every minute. We assign the API response to a variable, so we can dig into it further. You most likely don’t have this metric, but I’ve been gathering this metric for awhile, so I’ve got roughly a week’s worth of data at a per-minute level. Of course, my metrics are subject to the built-in aggregation policies, so my per-minute data is only good for up to 15 days. As you can see, the command is a little lengthy, but when you use PowerShell’s tab completion to help finish the command and parameter names, typing it out isn’t too bad. Because we’re querying the most recent hour’s worth of data, we should have exactly 60 data points in our response. We can confirm this by examining PowerShell’s built-in Count property on the Datapoints property in our API response. The data points aren’t in chronological order when returned, so let’s use PowerShell to sort them, and grab the most recent data point. Now we can take this data and start exporting it into our preferred external data store, for long-term retention! I’ll leave it to you to explore this API further. Due to the detailed options available in the GetMetricStatistics API, I would strongly encourage you to read through the documentation, and more importantly, run your own experiments with the API. You need to use this API extensively, if you want to export data points from CloudWatch metrics to an alternative data source, as described earlier. In this article, we’ve explored the use of the AWS Tools for PowerShell to assist you with writing metrics to Amazon CloudWatch, searching or querying for metrics, and retrieving metric data points. I would encourage you to think about how Amazon CloudWatch can integrate with a variety of other services, to help you achieve your objectives. Don’t forget that after you’ve stored metrics data in CloudWatch, you can then build dashboards around that data, connect CloudWatch alarms to notify you about infrastructure and application issues, and even perform automated remediation tasks. The sky is the limit, so put on your builder’s hat and start creating! Please feel free to follow me on Twitter, and keep an eye on my YouTube channel.